My friend Jenny had a baby girl a couple of weeks ago and when I got the message about Iselle's arrival this sinking feeling came over me. I didn't make anything for her! Jenny is part of a group of moms I teach crochet to every week while our kids are having their art class so I can't just run out to the Gap, I have to produce! It wasn't a surprise announcement, I had plenty of time and why it didn't hit me until I got the news I have no idea. But I had a few days before I saw her so I thought a small blanket would be perfect. And here it is, Baby Iselle's Blanket. Yarn used: 2 Nature's Choice organic cotton by Lion Brand in Strawberry; 1 ball in Pistachio for the crochet border. I love this super soft yarn! I think I need a simple jacket out of it. Needle & hook used: #10.5 24" and a J hook for the border. Gauge: 3sts & 4 rows = 1" in Chain stitch pattern. Finished measurements: 20.5" x 22"
Cast on 56 stitches and work the Chain stitch pattern until the piece measures 20.5". Bind off. With a J hook and the 2nd color, single crochet around the blanket twice. Border should measure .75". Weave in the ends, block blanket and enjoy! Unfortunately Lions Brand discontinued "Natures Choice", the yarn used for this blanket. I had some yarn left over from a project, Illimani Yarn's "Llama ll" a wonderfully soft bulky weight baby llama. 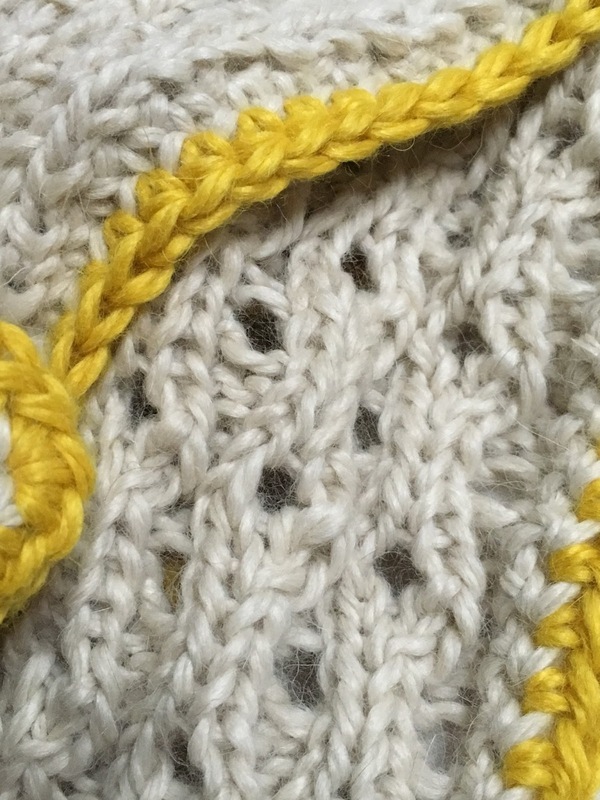 I used 3 skeins for the main color (bone) and 1 skein of a contrasting color (lemon yellow) for the crochet border. Using the above pattern I was able to get the same dimensions as stated above. The perfect little model, Max. I'm going to figure it out and adjust the pattern. It was a quick easy knit so I'm going to want to make it again. Oh good! I will watch for it! That is the sweetest little blanket! I love having quick knit gift ideas like this! Thanks for making posting the free pattern!! Thanks KQD! And thanks for sharing the link! Just a question from a beginner knitter. After you slip one are you supposed to slide it over the knit 2? Hi Jess, The Slip 1 is just to give a clean edge on the blanket, also making it easier to do the crochet border. Hope that helps! "... Well, I couldn't leave it alone it was still bothering me that I made what for me felt like a mistake (though Baby Iselle hardly minds!) so this morning I did a small swatch and adjusted the pattern above so it will in fact start & end with K2..."
She already fixed the pattern. No need for me/us to do so. Hi Darci, use multiples of 4 (multiply what's between the *'s). Hope this helps! Knit 1 La, love this blanket and need a quick knit for a baby girl coming in 6 weeks. Am I to understand that the pattern above is now corrected? I do not see in the pattern where it ends in a K2. Beautiful! Could you tell the specifics for making this somewhere around 32 -36 inches square? I'm new to knitting and don't yet understand that conversion process. Hi Katee! I love this pattern...I made it for one my best friend's twins and she loves it so much she wants me to make one for their king size bed...LOL! Anyway, I'm going to be making another one soon and would like it to be a bit bigger. I'm specifically wondering how much yarn I will need and was wondering if you used 2 complete skeins for the main color or if you had some left over. I figured that would help me come up with a more exact idea. Thanks so much! Oh, oops! I called you by the wrong name! LOL - I had just read a comment from Katee and was sidetracked. So sorry! Thanks Knit 1 LA for answering my question. I forgot to ask previously is the first stitch slipped knitwise or purlwise. 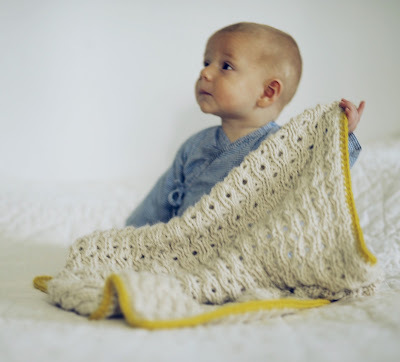 I also love Lion Brands Organic Cotton and make most of my baby blankets from this yarn. Have figured out my stitch count, have stitches on needles, I am ready to go. Thanks for a beautiful blanket. Most people I know who are beginners don't care about gauge including my mother who knits every day and has been for 60 years. How many stitches did you put on and how much yarn (grams or ounces) and what weight yarn works best. Thanks so much, it would be great if this info was in the pattern including to pear the slip stitch. Thanks. I love this pattern! I have a question about the pattern. Row 10 says to "Repeat from row 2". Does that mean that Row 1 is not repeated at all throughout the pattern? The pattern would consist of rows 2-9? I just knit Rows 1 -9 and was about to post the same question Debbie !!! So glad I came here to check it out, I was scared I'd be having to stop knitting until I got an answer !!!! I am using Berroco "Weekend" on size 10 needles., so far, so good !!! I am going o edge it in green, as you did ! Hi, Simply Soft is in the same weight category as Nature's Choice but get's a half stitch more per inch so you could try to use the same needle/hook combination that I did. I would do a little gauge swatch and if it seems too loose then go to a US #10 with an i hook. I am totally confused. I sat all day and tried this pattern....over and over. Do I knit as stated then repeat only what is between *s? Or do I do the whole row until the end. For instance: Row1: Sl1* kw, pw,*k3. Do I work this, then work just between * until end and then work k3? Yes, repeat what's between *'s. Hope this helps! So is the pattern starting with Sl 1 the newest version? Today is 1/7/16 and I am not sure the one that I just printed reflects the correction you noted following your disclaimer. Thank you.